Danish political writer; born Oct. 26, 1819, at Vordingborg, Denmark; died at Copenhagen Aug. 15, 1887. The dream of his youth was to become a famous physician, but as Danish church orthodoxy prevented him, because he was a Jew, from taking his B.A. degree (1836), Goldschmidt gave up the academic course, and in 1837 started the "Nästved Ugeblad" (later called "Själlandsposten"), a political weekly. He at once came into conflict with the authorities, and was fined heavily, and condemned to submit his publication to censorship for a year. Goldschmidt sold the paper, and as the Danish king (Frederick VI.) died at this time and a liberal government was expected under his successor (Christian VIII. ), he moved to Copenhagen, and again entered into politics, with a new paper, the "Corsaren" (October, 1840). This journal was a brilliant but reckless paper, representing extreme republicanism or socialism, and taking a strong stand against the crown, which had failed to grant the expected liberties. For this the government promptly condemned Goldschmidt to imprisonment on bread and water for twenty-four days, and to the permanent censorship of his paper. But he was undaunted and continued the publication of the "Corsaren." It likewise brought him into conflict with individual public men, but it matured his mind, won him fame, and caused some novels of his to sell so well (1846) that he went abroad on the proceeds (1847). In Coppet he met the reformed priest Piguet and was much influenced by him. Goldschmidt himself admits that an unconscious Christian influence is perceptible in "Nord og Syd," which he edited 1847-59. This magazine was also political, but of a much more moderate tone. 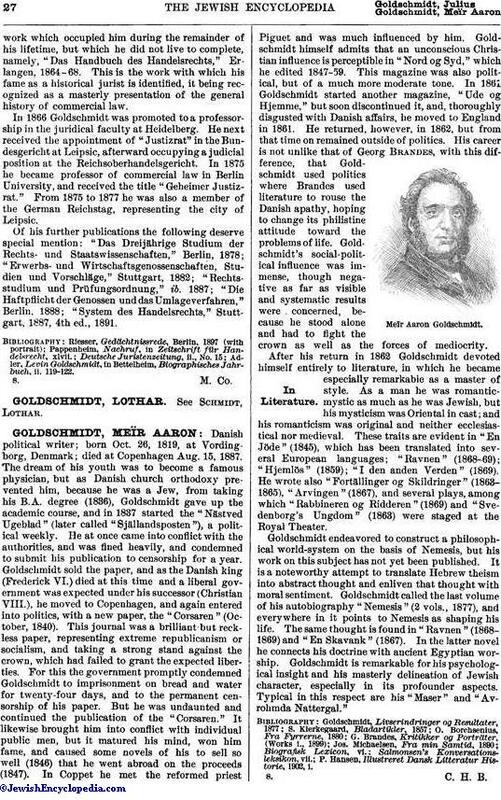 In 1861 Goldschmidt started another magazine, "Ude og Hjemme," but soon discontinued it, and, thoroughly disgusted with Danish affairs, he moved to England in 1861. He returned, however, in 1862, but from that time on remained outside of politics. His career is not unlike that of Georg Brandes, with this difference, that Goldschmidt, used politics where Brandes used literature to rouse the Danish apathy, hoping to change its philistine attitude toward the problems of life. Goldschmidt's social-political influence was immense, though negative as far as visible and systematic results were concerned, because he stood alone and had to fight the crown as well as the forces of mediocrity. After his return in 1862 Goldschmidt devoted himself entirely to literature, in which he became especially remarkable as a master of style. As a man he was romantic-mystic as much as he was Jewish, but his mysticism was Oriental in cast; and his romanticism was original and neither ecclesiastical nor medieval. These traits are evident in "En Jöde " (1845), which has been translated into several European languages; "Ravnen" (1868-69); "Hjemlös" (1859); "I den anden Verden" (1869). He wrote also "Fortällinger og Skildringer" (1863-1865), "Arvingen" (1867), and several plays, among which "Rabbineren og Ridderen" (1869) and "Svedenborg's Ungdom" (1863) were staged at the Royal Theater. Goldschmidt endeavored to construct a philosophical world-system on the basis of Nemesis, but his work on this subject has not yet been published. It is a noteworthy attempt to translate Hebrew theism into abstract thought and enliven that thought with moral sentiment. Goldschmidt called the last volume of his autobiography "Nemesis" (2 vols., 1877), and everywhere in it points to Nemesis as shaping his life. The same thought is found in "Ravnen" (1868-1869) and "En Skavank" (1867). In the latter novel he connects his doctrine with ancient Egyptian worship. Goldschmidt is remarkable for his psychological insight and his masterly delineation of Jewish character, especially in its profounder aspects. Typical in this respect are his "Maser" and "Avrohmda Nattergal." P. Hansen, Illustreret Dansk Litteratur Historie, 1902, i.